Foster Park, Queensbury, Sunday, 4 March, 2018. 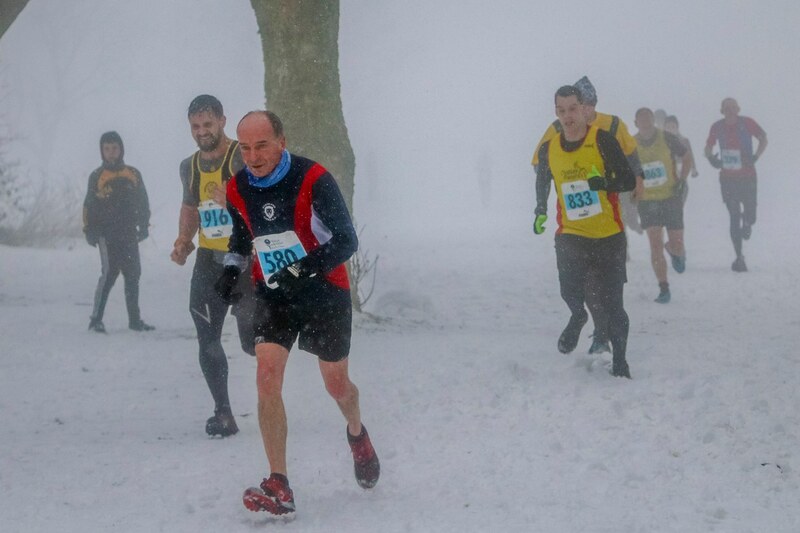 It could hardly be said that all roads led to Queensbury for the final Winter League race of the season; half of them were deemed impassable due to the remnants of the Beast from the East, which had left the outlying roads and pathways hampered by drifting snow. Where everyone parked their cars is anyone’s guess. 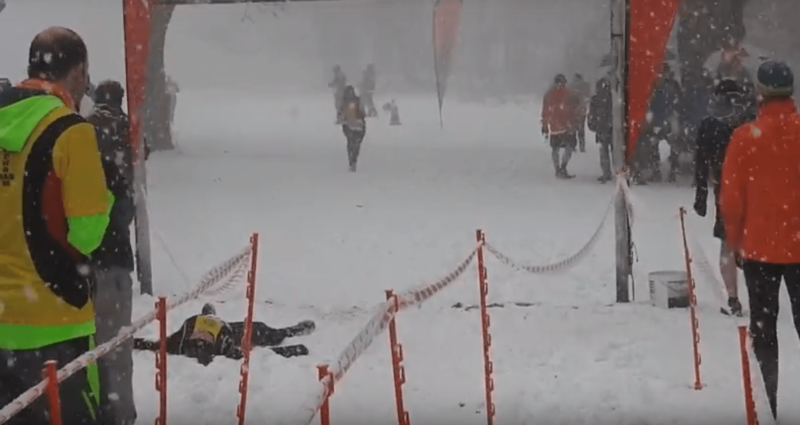 The race officials had been out in the early light to check the course was safe, and though it looked, on the face of it, worse than when the event was cancelled last December, here there may have been more snow, but less ice. The race got the green light. And they’re off. Tim Brook (left) staking an early claim. 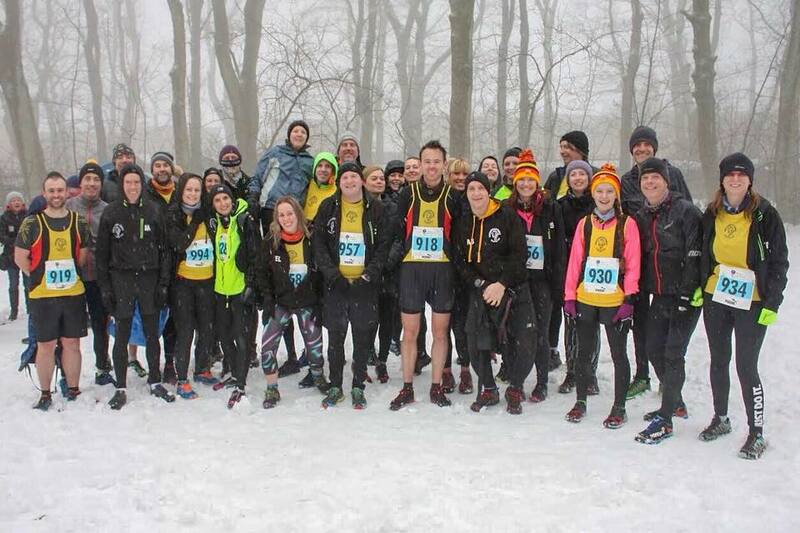 Nothing much deters the Northowram Pumas, and the thrill of running in ankle deep snow as opposed to mud enticed thirty-nine runners from the comfort of their beds. Foster Park, where the race started, cut a picturesque sight, a blanket of virginal snow lying peacefully over the lush green grass underneath. Oh that it would remain so. But the moment starter Dave Hepworth had counted down the seconds, the park would never look the same again. Luke Cranfield closely followed by Jude Roberts. A mass stampede followed, a total of 309 runners charging down to the far right hand corner of the park for what was just the beginning of a gruelling 4.2 mile course. And just to make them feel at home – this is the Winter League, after all – almost right on cue, it started snowing. Yeh! Andy Haslam, either dressed for the occasion, or auditioning for the role of Mole in the next ‘Wind in the Willows’ panto. You decide. The route hadn’t changed much from the previous year, so there was the accustomed anti-clockwise circuit of the perimeter of the park, which involved a hefty climb from the bottom, and another climb up through the woods before descending back to the start line and heading for the bottom corner once more. Here, the course doubled back on itself as it swung up through the line of trees which run adjacent to the park, before it crossed the top of the park and into the section of woodland on the opposite side. It then picked up the reverse of the perimeter of the fence, once again landing at the bottom section of the park, crossing into fields and a run out into the countryside, eventually coming out on Stocks Lane. All in snow, don’t forget. The route then carried down this track before veering right into more fields, climbing at certain points before reaching a farm track which, assuming one followed the right direction, brought the runners out at the junction of Stanage Lane, a familiar section of the route to most Pumas. It was but short, however, as the runners were then directed through a stile and down the fields, heading back towards Foster Park. Hitting the bottom section of the park once more, the competitors ran adjacent to the park itself, a tiresome section, so close, yet so far away from the finish line, and on an incline. 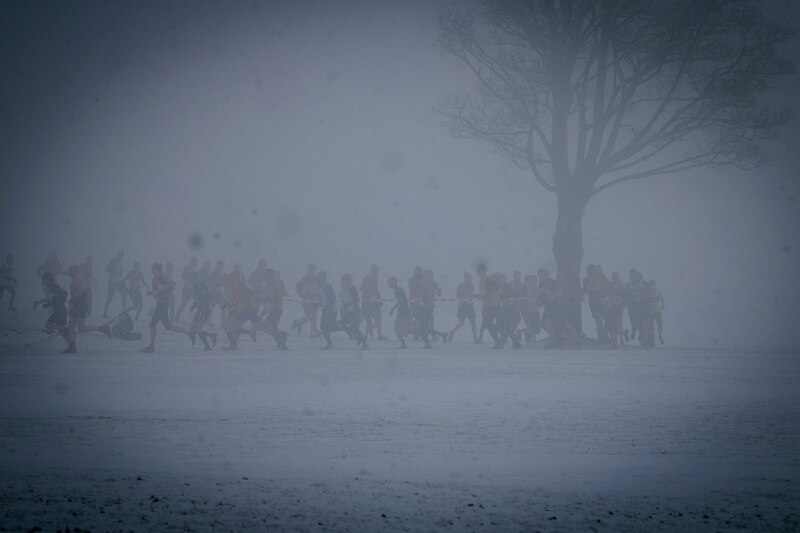 They then entered the woods and made their way back to the bottom of the park for one last time through the trees, before following the perimeter as they’d done at the start, although this time, as opposed to last, the course omitted the final wood section that came out by the finish line; before reaching it, the runners were directed towards the mound down the field, rounded it, then headed for the finish line, just beyond the first set of goalposts. Tracey March adopting the stance that if you can’t see where you’re going, things don’t look as bad. 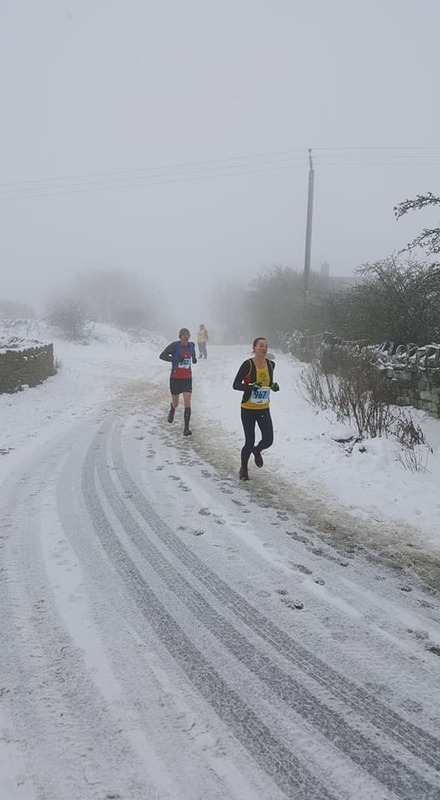 The mist had descended by the time the first of the runners came home, Queensbury’s Tom Collinge crossing the line first, some way ahead of Stainland’s Gavin Mulholland. There was a trickle of runners passing through after that, and the atmosphere was all rather tranquil. Then, suddenly, there was a commotion, as, through the gloom, there was hurried activity. 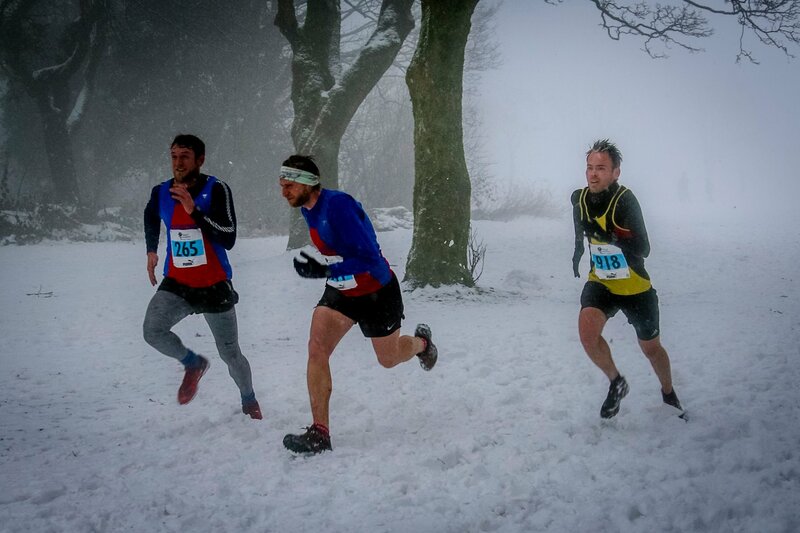 It was like the Batman and Robin scene in ‘Only Fools And Horses’ (1996), but here, three runners were making a mad-dash for the line, among them our own Tim Brook. He was edged out of that mini-battle by Dan Naylor of Baildon, but, by sneaking in front of his club mate Jeff Singleton, Tim secured a fourteenth place finish. Matt Newton negotiates this stile, although word has it that he’d spied a coin of minimal value. “Every little helps,” he would claim. 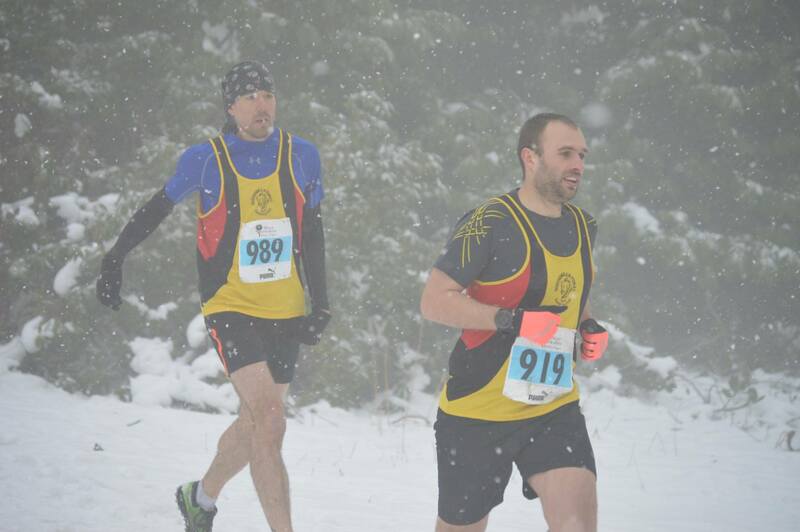 As far as the Pumas were concerned, only one other finisher came close to crossing the line in similar fashion as Tim, that being Andrew Tudor. He suddenly found that extra bit of energy to beat the pack around him, which included team mate Chris Ellis, to claim the coveted 130th position. Sadly, Andrew’s efforts didn’t get him onto the scoring sheet, as there were several other Pumas in front of him, with Luke Cranfield the second home, finishing seventeenth. Also scoring for the male team alongside Veteran Tim were Rick Ralph and Jude Roberts, complimented by Deke Banks, Robert Shirlaw and Jon Ding to total 1,819 points and give them an amazing fourth position on the day. 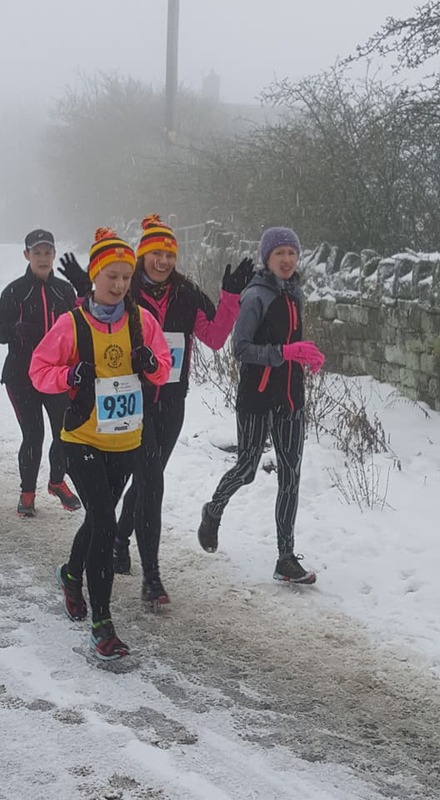 The Ladies team went one better, finishing third, helped in no small way by Diane Cooper, the first female Puma home, crossing the line in 109th. She was backed up by Jane Cole, Kirsty Edwards and Ally Canning to give the Ladies’ team 1,133 points. 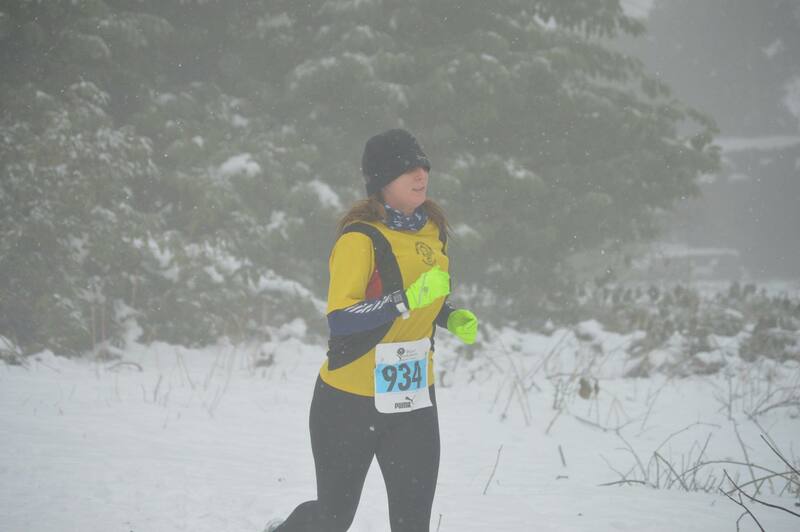 Diane Cooper hits Stanage Lane running, slipping and sliding. With Tim Brook, Rick Ralph and Diane making up the Veterans’ scoring, they totalled 849 points, to finish on the day in an incredible third place, with only Stainland and Baildon above them. The SuperVets also had a field day, with Robert Shirlaw and Jon Ding backed up by Katrina Wood, who had one of her best runs, to give the team 646 points and sixth place on the day. Overall, Northowram Pumas finished in fourth place of the fourteen competing clubs. Words such as ‘sensational’, ‘brilliant’, ‘awesome’ and ‘flipping amazing’ were used by some to describe the achievements of the team, and I’ll add to that by saying it was simply an astonishing feat. The smiles and the waves disguise the fact that Charlotte Reason, Shana Emmerson and Gabby Kenny had moments earlier been discussing the merits of the men in the previous evening’s ‘Take Me Out’. Elsewhere, Paul Hopkinson ran home in 198th, wondering how he’d gone from the buzz and excitement of Tokyo just seven days earlier to this, but the word ’jetlagged’ was never mentioned. Lindsay Grix made drastic child care arrangements and set off in good time to make sure she made the start, so due respect to her. A race within a race. Tim Brook makes a bolt for it, but whilst he will see off Chris Burke (center) he will be pipped to the line by Jeff Singleton. 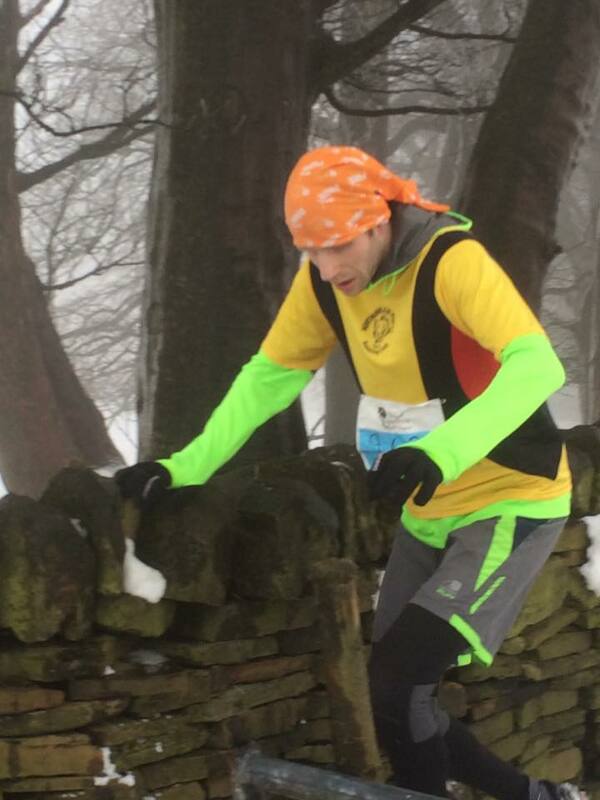 And in today’s other mad-cap finish, Andrew Tudor comes up on the outside to sneak past Stainland’s John Bassinder (64, his age, not race number). 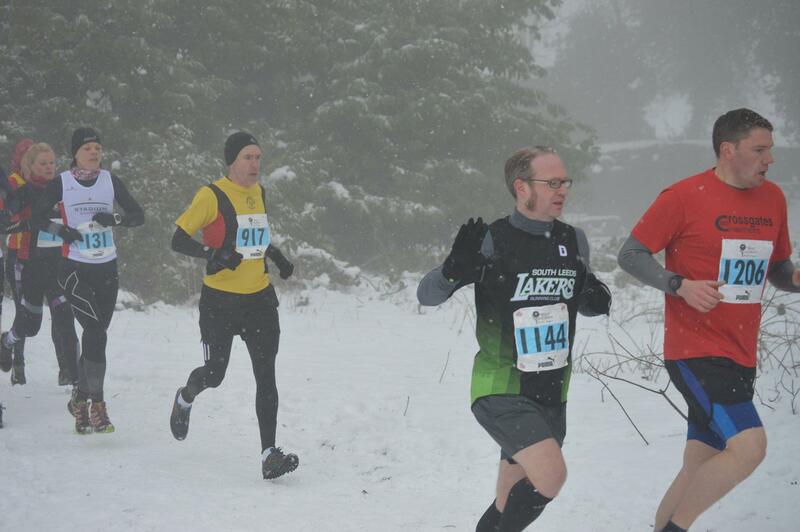 As suggested above, snow had begun to fall just as the race started. 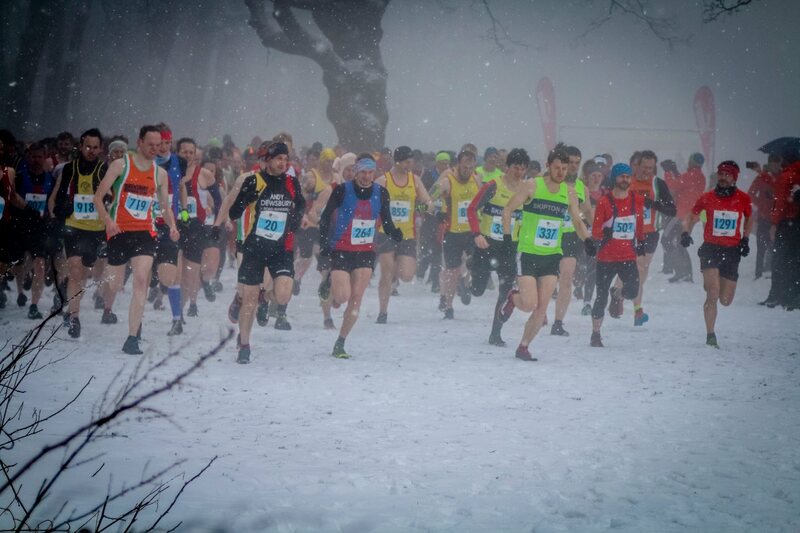 It’s fair to say that the later the runners finished, the worse the conditions were. And whilst most people gave the impression that they’d been ‘done in’ by the time they finished, Helen Jackson’s actions outwardly demonstrated how others probably felt, as she flung herself to the ground and lay prone on her back for what seemed an age. There were fears, naturally, until one marshal allayed these when he caught her just about breathing. Further down the line, Gabby Kenny made a strange admission: “You won’t hear me say this often, but I enjoyed the run,” then gave much credit to Shana Emmerson, whose girl talk along the way helped take their minds off the job in hand. A picture can say more than a thousand words, so I won’t say much more. This is Helen Jackson flat on her back having crossed the line. Photos courtesy of Joanne Punt, Carolyn Collinge, John Loughran and Steve Smith (Smith Photography).